Its charter had to be changed to enable his election. 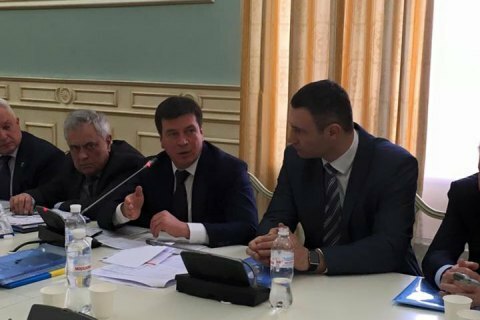 Kiev mayor Vitaliy Klitschko was elected the head of the Association of Ukrainian Towns at its session today. According to the existing charter, its could only be chaired by a chairman of local government with at least five years of experience in public authorities, including four years as mayor. Klitschko did not meet the requirements therefore, to enable his election, it was decided to change the charter. Association members who opposed this manoeuvre believe the changes were discreetly pushed forward by the presidential administration seeking to control the organization. Lviv mayor Andriy Sadovyy is one of the opponents. He was also considered as a possible candidate for the association head, but his candidacy was not put to vote. "This looks like a theatrical play, not an assembly of the association of towns," he said after the vote. Khmelnytskyy mayor Oleh Semchyshyn confirmed in a comment for LB.ua that the amendments to the charter were rather questionable. He said they were adopted during the voting and, as it was said on the sidelines, specially "for Klitschko". The association was previously headed by Kryvyy Rih mayor Yuriy Vilkul who refused from a re-run.